Max Protein snacks are essentially made of 7 healthy grains - Oats, Wheat, Soy, Ragi, Gram, Corn and Rice. They are neither fried nor baked. The chips are extruded or hot-air puffed, which is a procedure we use for making popcorns. India’s wellness industry is seeing a high, thanks to the consumer become more aware and affluent. At the same time, there is still a large population in India that considers snacking on chips, assorted namkeens etc when hunger strikes. Besides, almost 80 per cent of Indian diets are protein deficient, according to a survey by the Indian Market Research Bureau. Enter RiteBite Max Protein snacks – packed chips that look at addressing all three of the above mentioned factors without compromising on the taste. Naturell India, which was largely known as one of the first to have brought the concept of granola bars in India, came up with healthier snacks/chips earlier this year. These are not potato chips, not baked chips, but hot air puffed snacks made for the snacking population who wants to binge yet stay healthy, the health conscious population as well as the protein deficient population. “Whenever we think of a snack, the Indian consumer thinks of something salty, spicy alike. So, you typically end up eating a samosa or something. Then comes packaged food like the namkeen and then there are chips or nachos or banana chips. But these things have very unhealthy fat. But we wondered as to what we could do to combine the goodness of healthy ingredients and the Indian snack market and get something that we are all used to eating. 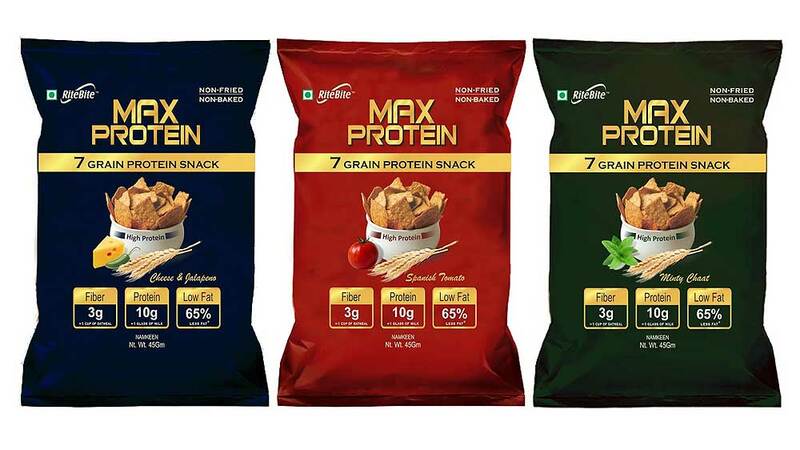 That’s where Max Protein snacks came in,” Vijay Uttarwar, Founder and CEO, Naturell India told wellnessindia.com. Max Protein snacks are essentially made of 7 healthy grains - Oats, Wheat, Soy, Ragi, Gram, Corn and Rice. They are neither fried nor baked. The chips are extruded or hot-air puffed, which is a procedure we use for making popcorns. Speaking to wellnessindia.com, Ravinder Varma, Brand Manager, Naturell India confirmed that though a bit of oil is used in this process, it is healthier oil, that is rice bran oil, and what makes it even healthier is the fact that the oil is not heated. It is available in three flavours – Spanish Tomato, Cheese & Jalapeno, and Minty Chaat, which are the red, blue and green of Max Protein. Each variant is available in a 45 gm pack, which is priced at Rs. 40 and a 120 gm can, priced at Rs. 120. Naturell India says that where these chips stand out is that they are typically healthy. The 45 gm of chips pack contains 10 gm of protein, which is three times higher than other chips, nachos, digestive biscuits or sandwiches. It also contains 65 per cent less fat than fried chips. Added to that, the fibre content of these chips is also higher than other chips or nachos. While Naturell India has placed these chips across retail stores, they are also aggressively tying up with fitness and wellness centres to sell them. This indicates that the snack maker is looking at targeting the general consumer as well as making it to the niche category too. It is attempting to break barriers between the health food and general food category. “We have tie-ups with gymnasiums and wellness centres from time to time. We do have tie-ups with some centres of Talwalkars and also some dieticians who recommend these chips,” Varma said. It has also placed Max Protein chips as a healthy mid-meal snack. “While you do plan for your 1 pm hunger, you do not plan for your 5 pm hunger and end up eating unhealthy food items. We aim to help you avoid that by replacing it with healthy yet tasty chips,” said Varma. Is the consumer liking it? The Max Protein snacks are already a rage among gym goers. It seems like gym goers were tired of avoiding spicy and salty snacks and now have something to eat guilt free. They also feel that it is good to have something apart from protein shakes to meet their protein requirement. In fact, fitness trainers are also seen recommending these snacks to their clients. We at wellnessindia.com also tried one of the flavours (Minty Chaat) and we have to say they were scrumptious. With the consumer responding positively to such products, it is an indication of how there’s growing demand for such products that are tasty yet healthy. Naturell India, meanwhile, has more protein based products in the pipeline. “We want to be known as the protein brand of India,” as Vijay Uttarwar puts it. Big fat business of anti-cellulite creams..